What is Syringoma and How Can It Be Treated? 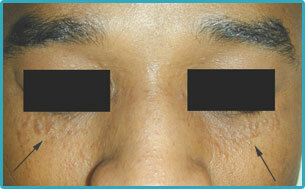 Little, pinpoint, flesh colored bumps around the eyes can cause you big concern. Not to mention they’re hard to cover with make-up and can alarmingly change the texture of your eyelid skin. These spots are known as syringoma. And unfortunately, they disproportionately appear in women who have a family history of them. If you research them, you will find that syringoma can occur as part of a few, more serious health problems such as Down’s syndrome, Marfan syndrome and Ehlers-Danos syndrome. But take a breath, a large majority of the time, they just happen and are not a sign of any greater, underlying health problem. However, cosmetically, they can cause a big problem. And syringoma can be confused for other types of spots, so make sure you have a good exam with a proper diagnosis before you decide to seek treatment. Celibre Medical Corporation offers treatment of syringoma either with precise laser resurfacing or hyfrecation. Hyfrecation uses electrical energy to produce heat that damages the tissue of individual syringoma causing them to go away over time. Laser resurfacing can also be done, but it costs a lot more than hyfrecation. If you’re suffering with syringoma and want to get rid of them, come in and see us today. We’d love to help you find the treatment that is perfect for you and to give you back smoother, younger looking skin around your eyes.